Hehehehe Noarlunga isn’t focusing on something as small as a grain of sand but he does work with very small prims and offers you eternity on your wrist. Hehehehe is a horologist: he makes watches. 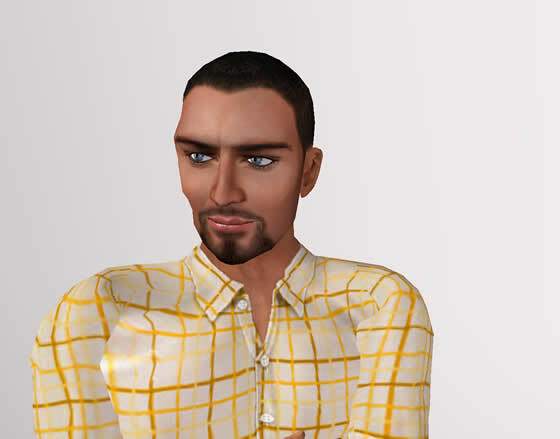 I asked him what brought him into the Second Life™ virtual world. So what lead to your running a business here? But you switched to watches, yes? What other items do you have other than watches and sounders? I asked whether his SL business sustained his RL or whether it was more of a ‘hobby’ that sustains itself, i.e. he makes just enough to maintain a SL lifestyle? What three pieces of advice would you offer anyone wanting to start a Second Life business? “The number one most important thing you can do as an SL businessperson is provide top notch customer service. When someone has a question, problem or complaint, address it swiftly and effectively. Many times the problem will be of the customer’s own doing. No matter what, resolve the problem with the utmost courtesy and appreciation for their patronage. Give them something a little extra for their trouble and you’ll have a repeat customer for life. Secondly, be prepared – expect the unexpected. A product you’ve put your heart and soul into may have lackluster sales, while something you never thought would work becomes your main product. Also, learn how to make your items visible to the various search methods on SL. For example, when you set up your store, make sure you are allowed to edit the land description and title for your lot. This is very important in getting into the search results. Read the forums and learn everything you can to improve your exposure and market positioning! In preparation for the Christmas season, Hehehehe has opened a new sim that combines his store with a theme-park winter wonderland, complete with free snowmobiles that avatars can ride around a huge tract of land. But he’s also a little apprehensive about sales in light of the current real life economic issues, and he’s also having to adjust to an increase in rental costs following the change in Openspace policy (he’s located on an Openspace). Yet he intends to work through this and continue doing what he does best; creating quality products and providing great customer service.